To Cite: Farrokh D. Isolated Primary Splenic Hydatid Cyst in a Six-year-old Boy: A Case Report, Arch Clin Infect Dis. 2013 ; 8(2):e16996. doi: 10.5812/archcid.16996. Hydatid disease is a parasitic infestation caused by the larval form of Echinococcus gronulosus and it remains a considerable public health problem in several Mediterranean countries such as Iran. Liver is the most common site of involvement. Lungs are the second most common sites of hematogeneous spread in adults and are probably the most common sites in children (15% - 25% of cases). Primary hydatid cyst of the spleen is a rare entity. Here, we describe a case of primary splenic hydatid cyst in a six-year-old boy who was presented with left upper quadrant pain and swelling. Abdominal ultrasonography revealed a large cystic mass in the spleen. Computed tomography (CT) confirmed the primary splenic hydatid cyst. No other organ or system involvement could be demonstrated. Total splenectomy was performed for the patient. Hydatid disease is a zoonotic illness and a significant problem in endemic areas. The disease is caused by the larval stage of Echinococcous tapeworm. The primary hosts are, usually dogs and the intermediate hosts are sheep and cattle. 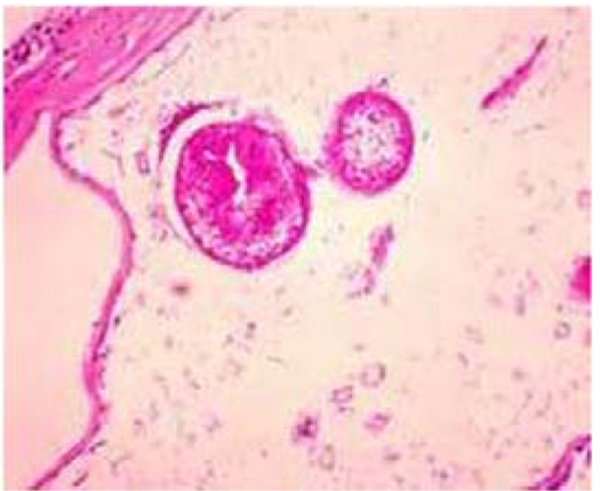 Human are an incidental host in the dog-sheep life cycle of the Echinococcus granulosus. The hydatid cysts grow to 5 - 10 cm in size within the first year and can be asymptomatic for years or even decades (1). In many patients, infection is detected only incidentally by imaging studies (2). When symptoms occur, they are usually due to the space - occupying effect of the cystic lesion in a confined space or complications such as rupture of the cyst (3). Liver and lungs are the organs most commonly affected by this disease, but the disease may be found in any organ (1). Primary infestation of the spleen by the parasite is a rare event and splenic involvement represents less than 2% - 5% of all cases of human hydatid disease in different areas (3, 4). Splenic involvement may be direct or indirect by the arterial route, once the parasite passes through the liver and lungs. Splenic hydatid cysts are usually solitary and their imaging features are similar to those of hepatic hydatid cyst in liver. We report on a six-year-old boy with primary splenic hydatid cyst, which is a rare event during childhood. A six-year-old boy was admitted to our general surgery clinic with a mass in the left upper quadrant of his abdomen. His mother reported that the mass had started to rapidly enlarge over the past three months. Family history was taken and it was discovered that he had been living in a rural area, with a dog in the house. His abdominal physical examination revealed enlargement of his spleen with an exophytic growing mass on the left side, with a mild tenderness at the left outer quadrant of the abdomen. He had no other abdominal complaints. His laboratory investigations, including blood complete picture, urine RE, blood electrolytes, liver functions tests were within normal limits. 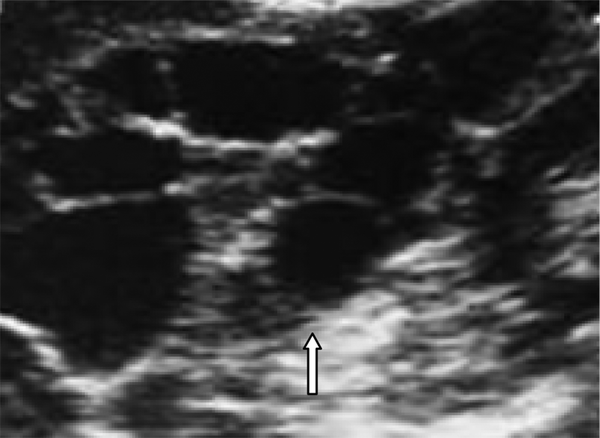 Abdominopelvic ultrasound showed a cystic mass with a smooth margin in the spleen measuring 6 x 6 x 7 cm with multiple internal septa originating from the spleen (Figure 1). 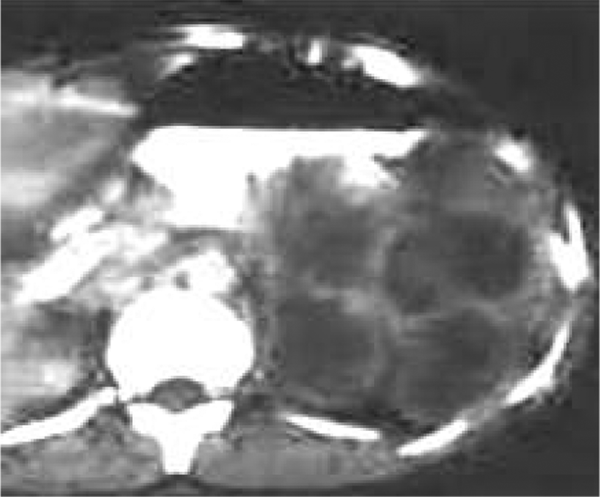 Computed tomography (CT) scan of the abdomen demonstrated a multiloculated and non-enhancing regular cystic mass with no evidence of marginal calcification (Figure 2). There was no evidence of a cystic mass in the other part of the abdomen such as the liver and peritoneum. The chest X-ray did not show any cysts. Echinococcous latex hemaglutination test and indirect hemaglutination test had positive results, 1:6000 and 1:2200, respectively. Our diagnosis was a splenic hydatid cyst based on imaging findings and hemaglutination tests. He was then referred to the surgical department for further management. Splenectomy was performed. A specimen was sent for histopathological diagnosis and the results obtained confirmed the diagnosis of splenic hydatid cyst. The patient received albendazole and antibiotics, and was discharged after the 10th post-operative day with a regimen of albendazole. The patient had an uneventful post-operative recovery (Figure 3). Hydatid disease, a worldwide zoonosis, is prevalent and widespread in most sheep raising countries in Asia, Australia, South America, in vicinity of East and Southern Europe (1). Two classes of parasites are mainly involved, Cestodea (flat worms, tape worms) and nematode (round worms). Echinococcus granulosus is a tapeworm and its adult form lives in the intestinal tract of infected dogs. Its eggs are excreted in the dog’s faces and swallowed by intermediate hosts such as sheep, cattle or humans. Human may become infected either by direct contact with a dog or by ingestion of foods or fluids contaminated by the eggs. After ingestion, the eggs feed from their coating and larvae penetrates the mucosa of the jejunum reaching, via the venous and lymphatic channels, to every organ of the body (1, 5). Hydatid may develop in almost any part of the body. The location is mostly hepatic (75%) then pulmonary (15%) and only 10% occur in the rest of the body. Splenic hydatid disease is rare, especially in children and the incidence is reported between 2% - 3% and 5% by different authors. Splenic involvement of hydatid cyst has a reported frequency of 0.5% - 6% with abdominal hydatidosis (4, 6). Primary infestation of the spleen usually takes place by the arterial route after the parasite has passed the two filters, hepatic and pulmonary. A retrograde venous route, which bypasses the lung and liver, has also been reported. Secondary splenic hydatid disease usually follows systemic dissemination or intra peritoneal spread following ruptured hepatic hydatid cyst. Hydatid disease is often manifested by a slow growing cystic mass. Splenic hydatid cysts are usually asymptomatic but may present as a painful mass in the left upper guardant. The complications of splenic hydatid cyst are mainly infection, intra-abdominal rupture and festulization to the bowel, mainly colon. Rupture of the cyst leading to spleno thoracic fistula has also been reported. Hydatid disease can involve the brain, bones, genital system, bowels, subcutaneous tissue, peritoneal cavity, the heart and soft tissues. In children the lung appears to be the most common site of involvement. Hydatid cysts with unusual localization may cause serious problems in the differential diagnosis (4, 6). Anaphylactic reactions due to rupture of the cyst are also reported leading to fever; in addition purist dyspnea has also been described with splenic involvement (5, 7). Hydatid cysts may be single or multiple, uni or multiloculated. Specific signs include visualization of calcification of the cyst wall, the presence of daughter cyst, and membranes detachment. The main differential diagnosis of splenic hydatiosis is splenic cystic lesions such as pesudocyst, hematoma, abscess and cystic neoplasms. Biochemical and hemaglutination tests may be helpful and eosinophilia may be the finding on hematological investigation (1, 3). 1. In large splenic cysts the splenic parenchyma is significantly reduced due to pressure atrophy. 2. The thickened fibrous membrane as seen in hepatic hydatid cysts is quite thin and fragile, so the risk of intra operative rupture is high especially in large cysts if a conservative approach is adopted during surgery. Spleen preserving surgery can be safely performed for some selected hydatid disease if the location of the cyst is peripherally or the cyst is small (11). Both these factors were absent in our patient. Bleeding is the most common complication of spleen preserving surgery. Complications of splenectomy such as hemorrhage, pancreatic or gastric injuries, thromboembolic phenomena and post splenectomy infection have been reported. Due to the risk of post splenectomy infection, which is approximately 10%, some surgeons prefer conservative surgery. Medical treatment seems to be ineffective and albendazole therapy is the mainstay of treatment in post-operative follow up (7, 11). Our patient was treated with albendazole for 40 days after splenectomy, and the patient had a good recovery and uneventful course. With the advances in laparoscopic surgery, laparoscopic splenectomy is being increasingly performed at advanced laparoscopic centers. However, some authors believe it is unsafe due to the risk of anaphylactic shock and intra-peritoneal dissemination, which can occur during an uncontrolled cyst puncture (7). We conclude that splenic hydatidosis, although rare, should always be kept in mind while dealing with splenic cystic lesions especially in endemic areas. Being familiar with imaging findings and performing serological tests can help establish the diagnosis of hydatid cyst. Financial Disclosure: The author declares that there is no conflict of interest.